Artist Patrick Matthews will be painting live at Paderewski Fine Art from 11 a.m. to 4 p.m. Saturday, July 2, through Thursday, July 7. When: 11 a.m. to 4 p.m. Saturday, July 2, through Thursday, July 7. Where: Paderewski Fine Art, Beaver Creek. More information: Call 970-949-6036, or visit www.paderewskifineart.com. BEAVER CREEK — Paderewski Fine Art will host one of the gallery’s favorite artists, Patrick Matthews, in Beaver Creek during the Fourth of July holiday. Matthews is known for his avant-garde painting style in which he uses bold colors and distinct vantage points to bring energy to his subjects. 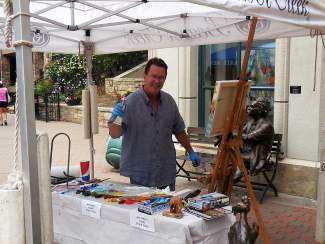 He particularly enjoys painting on the plaza during his visits while onlookers watch his unique style using both brush and palette knife. For years, Beaver Creek visitors have observed Matthews’ as works come to life during their stay. He is eager to discuss his inspiration and career while painting. He is one of Paderewski Fine Art’s most popular and charitable artists and has donated pieces to help numerous children’s organizations and the Steadman Philippon Research Institute. Look for the tall guy with a big smile and a cowboy hat at Paderewski from 11 a.m. to 4 p.m. today through Thursday. Paderewski Fine Art is located in Beaver Creek, on the Plaza level of the Hyatt, across from the ice rink. Call 970-949-6036 or visit http://www.paderewskifineart.com for more information.